When I joined the army at age 18, what I did not know until I got there was that I am allergic to army life. But I’d joined the airborne infantry, and so part of my training included three weeks of jump school at Fort Benning in Georgia. Anybody I served with will attest to the fact I wasn’t the most highly motivated trainee, to say the least, but once I got to jump school, I had a blast. “This is why I joined the army!” I can remember shouting over the roar of the engines of the C-130, as we all sat packed in its hold ready to make our first jump. 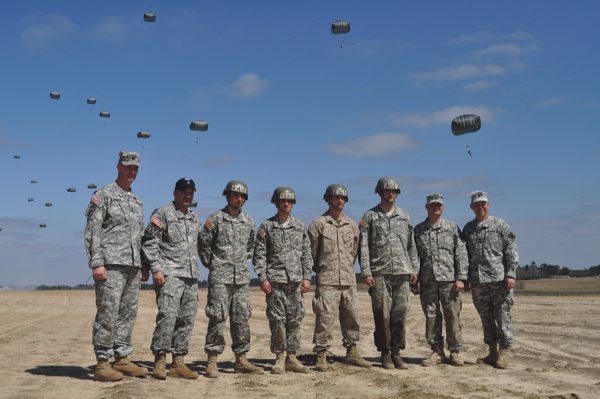 U.S. Army paratrooper school is a three-week course, open to any service member, regardless of their job. And it might seem odd to say civilians should be allowed to pay a fee to go through it, enduring the discipline, running, push ups, repetition, and ultimately five parachute drops into Alabama. As confidence builders, and things that make great stories go, the Army jump school is at the top of the list. Soldiers have been training to jump out of airplanes since the Second World War. They get extra pay for doing it, and by virtue of how badass it is, they move beyond non airborne, or straight “leg” infantry, and become the first rung of elite troops in the combat arms. But let’s just talk about the three-week experience at jump school. On day one, there’s a lot of screaming and hazing, which is interesting for a platoon of 53 guys who literally just came from infantry school. It was essentially impossible to phase any of us, while the other candidates, all officers and supply sergeants and clerks, were rattled and confused, unable sometimes to even execute 10 push ups. Also, candidates get weekends off in jump school, which is a luxury. But during the week, it’s a two mile run every day, probably an accumulation of 200 push ups a day, and there is no walking, Zero. We ran everywhere. The instructors, or Black Hats, were everywhere. One of them, Staff Sergeant Aponte, always had a look on his face like he was in the middle of being confused and outraged by something. One day in the mess hall, I turned from the drinks fountain and was sipping a bit of the orange drink from my very full glass, and there was Aponte, with his look of confused outrage. Of course what I was thinking was, “Well, because I am capable of doing both.” Of course, such an answer was out of the question. There was a little buck-toothed Black Hat that took us out into the pouring rain and had us do sit-ups and push-ups and side straddle hops for an hour in a field of saw dust. When we were marching back in, he began to sing the Mickey Mouse Club theme. And so we began to sing as well. And then there’s the 32-foot mock doors, from which we jumped, sliding off on cables, learning to exit the craft. And the 250-foot towers, from which we dropped free for the first time. And then jump week, when we jumped five times from aircraft onto Fryar Drop Zone. We’d learned to steer our ‘chutes by grabbing the risers and pulling on one side or the other of the canopy. But if we were lucky enough to get the other model, the T-10 Charlie ‘chute, then we had one with a 15 mph forward thrust and toggles for steering. Once on the ground, having been told to bring loose change along, we could buy pizza and soda. It was a jaunty element that made jump week even better. And then, of course, after all that, you’ve earned your jump wings. at our graduation ceremony, they played a barber shop quartet of “Beautiful Dreamer,” for whatever reason. It made the entire thing just a bit surreal. I’ll never forget it. But maybe better was the next song they played. As a joke during jump week, we would sing the theme song from the movie “The Green Berets,” just because we thought it was funny. And then, marching off the field after graduation, a snare drum welled up, and there it was, the actual song the movie. A lot of us could barely walk we were laughing so hard. But we’d also finally completed our training, and were now bound for 19 days of block leave. For any civilian willing to pay for the experience, that last day would be a grand one, filled today with selfies and tweets, and bragging rights. Not to mention having endured an experience reserved for only a few.